Now if you don't know them get over to there site and make a wee order. Now if you are like me and love yankee you will find a new love in Busy bees OH MY GOSH the smell from theses are like heaven and shhh but last a lot longer than Yankee. Hi. My name is Dee and together with my husband Haith, we own and operate Busy Bee Candles! The friendly face of the scented candle world. 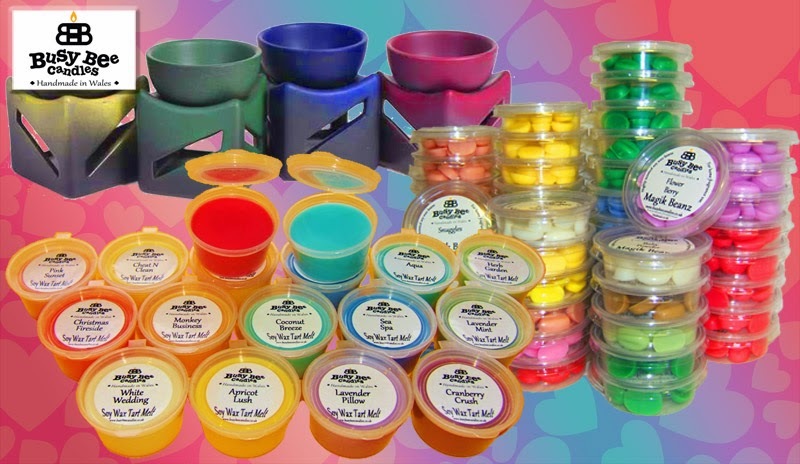 It all began as a hobby making scented candles and wax tarts for our own use. I used to work in an office & hubby worked as a chartered civil engineer. We used to buy British and American scented candles and wax tarts to use at home but there was always something missing with these. They were predominantly made of Paraffin (which I hate as it’s a crude oil derivative), burned poorly, smelt synthetic and were so expensive. That’s when we started to experiment making our own. We gave little baskets of our handmade goodies as gifts to family and friends for birthdays and as Christmas presents and that’s when it began! Friends started asking us to make them a batch and then friends of friends started to ask if they could buy them. Before long it became a full time hobby occupying all our spare time and more. Then we hit on the idea of turning our little hobby based in our kitchen into a full time business. We literally had no experience of retail or supplying shops etc. 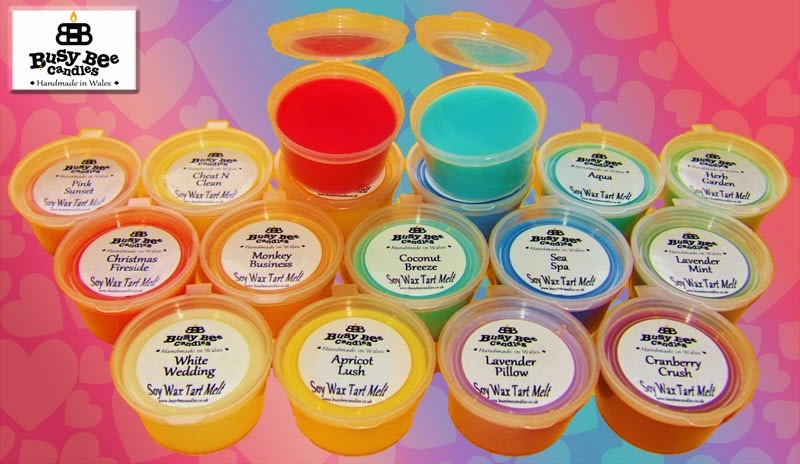 We used to hand write our fragrance labels for every candle & wax tart! We’ve come such a long way. We now run Busy Bee Candles from spacious workshops at our smallholding in Wales. We offer probably the largest selection of scented candle scents in the UK (possibly the world) with well over 200 stunning fragrances. Busy Bee Candles has grown rapidly since we started such a short time ago. We now ship thousands of parcels in the UK as well as internationally. We also supply retailers in the UK, Poland, Germany, Sweden, France, Italy and Finland. More are on the way. 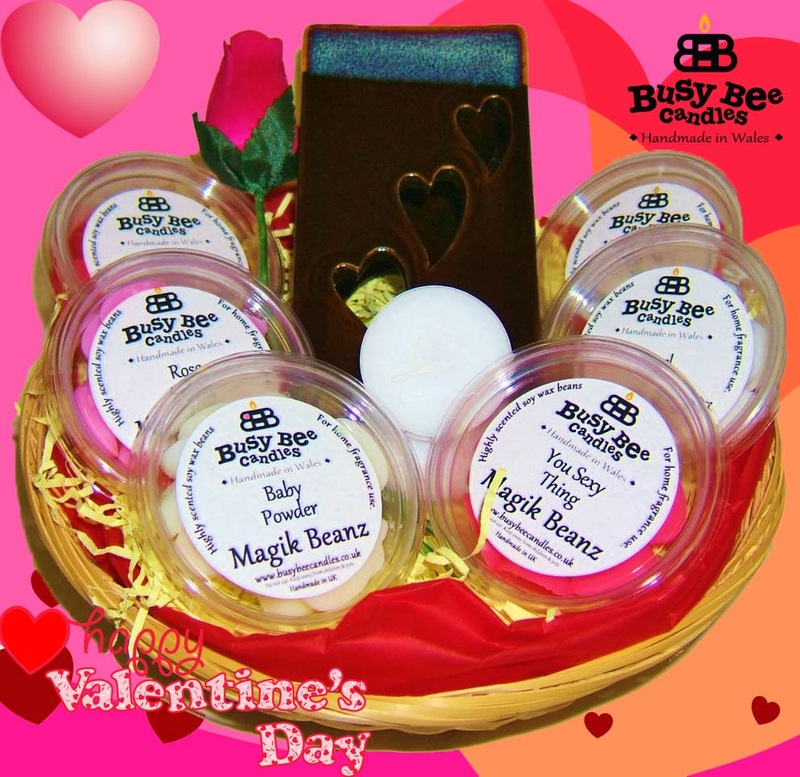 Busy Bee Candles offer a huge selection of scented candles and wax tarts as well as bath & body products, gift baskets and more. 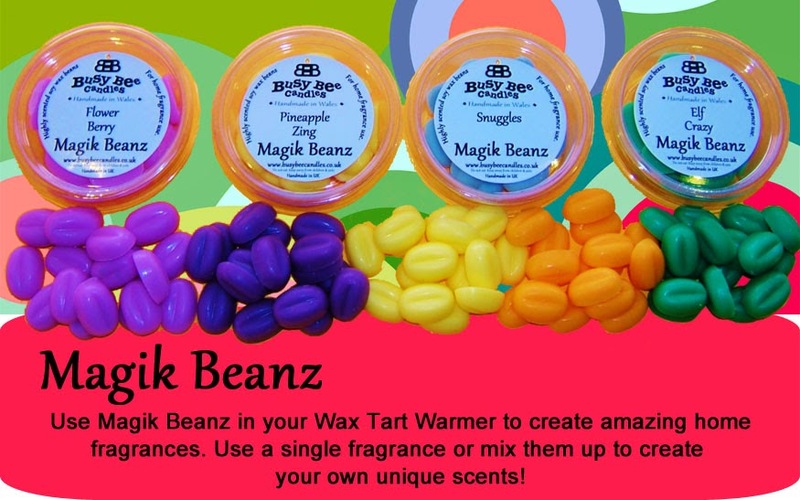 We’ve innovated continuously offering a world first No Clean Wax Tart that leaves very little clean up and our latest innovation, the super strength Magik Beanz melts. 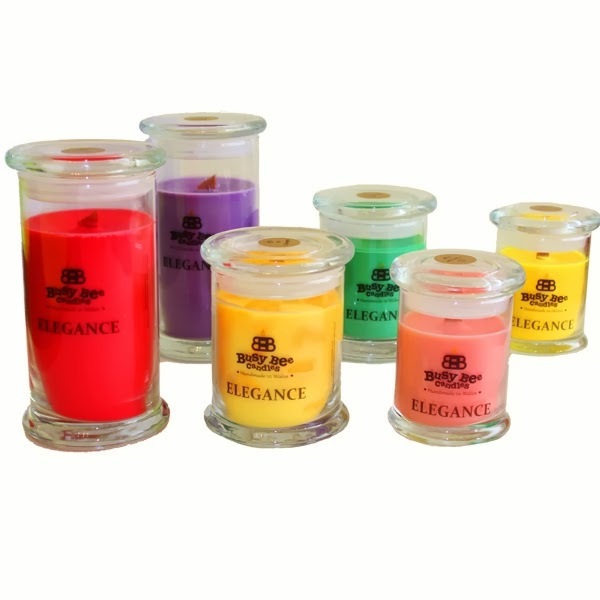 We’ve also recently introduced a new line up of Elegance Candles featuring wooden crackling wicks and a really huge fragrance throw and new bath and body products that have been really well received. Other new products are currently being developed. With inquiries arriving every day from the UK and overseas, the future looks bright for Busy Bee Candles. We’ve always stuck by our values of offering a superior quality handmade product made using natural ingredients at a great value for money price. Every one of our thousands of products is made by hand to this day. After all, we really did start out in our kitchen and that’s the way we like it. We are very social at Busy Bee Candles. We are always on Twitter (@BusyBeeCandles, https://twitter.com/BusyBeeCandles) or on Facebook (https://facebook.com/BusyBeeCandles) talking to customers, running a comp or sorting out a glitch. Follow us, like us and talk to us. We love a good chat J. We absolutely love working for ourselves. It feels like an extended family with our small team at Busy Bee and I couldn’t imagine working for anyone else again. My advice to anyone out there that has an idea or loves doing something in particular – do it! Turn your passion into your day job. Another amazing story! This really inspire me I love that this all started as a creative hobby. Get over to Busy Bees and Have a look around. I'm totally obsessed and have a big order coming for my Mother in laws birthday. I'm so excited to share this with her as she loves candles.